Cheltenham is not the be all and end all but National Hunt’s March festival is very much an option for trainer Henry Oliver and Northants-based owner Richard Whitehead after the victory of Dr Des at Towcester on Thursday. Dr Des gave Whitehead his sixth winner of the winter season when justifying odds of 4/7 under James Davies in the Star Sports Daily Specials Novices’ Hurdle over 2m 3f, coming home six lengths clear of the Alan King runner Voie Dans Voie. A success at Stratford in October before subsequently being a runner-up in two much classier contests at Ascot, Dr Des was given the Towcester outing to prove the son of Double Eclipse would stay 2m 5f at Cheltenham. That slight issue has now been proven without any doubt so Oliver’s Worcestershire team have widened options, but it is not certain Dr Des will run at Cheltenham at all. Oliver has already trained 19 winners this season, closing in on his best ever haul of 21 and could have other Cheltenham Festival runners such as Dresden or previous Towcester winner Ozzie Thomas which is being mooted for the Fulke Walwyn/Kim Muir Amateur Riders’ Handicap Chase. People who are forced to squint at the small print on the racing pages have caused an issue for Waltham-on- the-Wolds trainer Laura Morgan who confuse her with Classic winning trainer Laura Mongan. Yet Morgan, the daughter of former trainer Kevin Morgan, looks like making a name in her own right after saddling a fourth winner with her first ever runner at Towcester thanks to 14/1 chance Skipping On in the 2m conditional jockeys’ handicap chase. A long run in to the contest was deemed necessary after jockeys raised the issue of low-lying sun although whatever sunshine had ever been visible had long since disappeared by the time the Patrick Cowley-ridden runner had bounded past the post seven lengths clear of course winner Heurtevent. Morgan said: “It is very much a family team operation now I am back at home. A Cheltenham Festival target also looks the plan for dual Towcester winner Spice Girl (3/1) which turned over odds-on shot The Vocalist and gave jockey Harry Stock his third success at the Northamptonshire track since October. Meanwhile, there was a surprise in the 2m Call Star Sports On 0800 521321 handicap hurdle over 2m when 12/1 chance The Game Is A Foot made the most of a tumble by favourite Doc Carver, who was still travelling easily when knuckling on landing three flights from home. 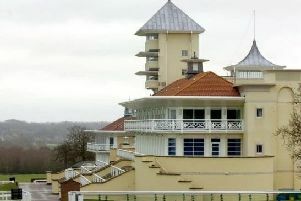 Grant Cann has made a series of successful trips to Towcester over the years. Based at Lower Hanswell near Bath, he sent up 5/1 favourite How’s My Friend to take the 3m handicap chase, coming home six lengths clear of Bobonyx.